The number of Spanish female students that start and end higher education outnumbers the male students, with an overrepresentation in some fields, as it is the case of Psychology. This female superiority remains in the initial steps of the scientific career, but the reverse occurs at high level scientific and academic positions. In this context, an archival bibliometric study was designed to know if the scientific profile (e.g., publications, cites, internationalization, order of signature) of the Spanish psychological female researchers differs from the male researchers. As for this, the papers indexed at the Core Collection of the Web of Science from 2000 to 2009 were reviewed searching for the topics Spain, Espana, psychology, psicologia. This search was completed with a particular search for each author identified by this method. The results from those papers authored by Spanish psychologists showed that the Spanish male researchers authored more papers; that the distribution of papers published by knowledge areas was similar for both genders; that female researchers signed papers in less relevant positions; and that the internationalization and received cites of the publications were analogous for male and female researchers. The results are discussed in relation to the equality of opportunity between men and women for the development of an academic and scientific career. Keywords: gender; female researcher; bibliometric study; psychology; Spain. Technologies have become an essential company in teenagers’ daily life. They access and use them more constantly but few people are aware of their risks, including the cyberbullying. This study analyses the daily access and use of mobiles phones and computers, and the prevalence of cyberbullying, media used to harass others and its association with technologies’ daily access, gender, grade level and school achievement. We took information from a representative sample of 1353 secondary students randomly selected. Results show a high daily access to mobiles phones and computers, being the average between one and four hours per day. Both media were mainly used to communication and entertainment purposes, showing gender and grade level differences. Analyzing the prevalence of cyberbullying, statistical differences by gender and school achievement appeared, which support this kind of malicious use of technologies and the need for families’ and schools’ prevention and intervention actions. This study presents the opinion of the students of the University of Barcelona about the teaching skills that a good teacher should have. We conducted a survey through mobile devices among 1062 students in the first term of 2014. An Exploratory factor analysis (EFA) gathers three main factors with eigenvalues greater than one, which explain 53.59% of variability: factor 1, methodology, teaching planning and good knowledge transmission; factor 2, interpersonal communication; factor 3, coordination of teaching team members. The reliability of the three factors is confirmed (α from .837 to .727). We did not observe significant differences according to the area of knowledge and level of education for any teaching skill, although gender differences were detected in factors 1 and 2. Most students defined as good teaching qualities the following aspects: a reliable teaching plan, the use of appropriate teaching methods and having interpersonal skills. Outcomes showed significant coincidences by the comparison of the importance given by students and teachers to each teaching skill. The contributions of the students will be useful to redefine teaching skills and recognise indicators to assess teacher’s performance. Keywords: University teachers; teaching skills; student's opinions; teaching quality; teacher training. 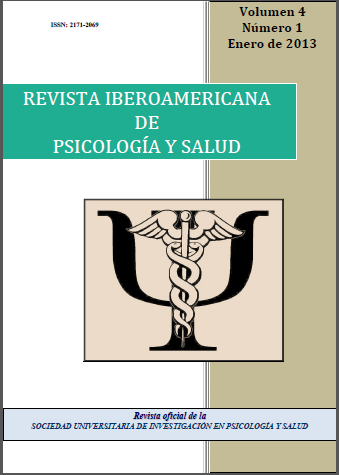 The aim of this descriptive work was to analyse the presence of researchers that work in Spanish institutions and are part of the editorial committees and directive boards of Ibero-American journals of Psychology indexed in the database Journal Citation Reports (JCR 2012). A total of 22 journals were analysed. The results demonstrate that researchers from 39 different countries are part of directing committees and council in these journals. Out of these, 45.2% are Spanish. Spanish researchers are mainly part of psychology journals edited in Spain, Colombia and Argentina. Universities are the institutional sector were 97% of the Spanish researchers work and that are included in the psychology journals committee, being the Universidad de Valencia, Universidad Complutense de Madrid and Universidad Autónoma de Madrid, those that have a greater number of researchers collaborating with these publications. Keywords: Scientific journals; Ibero-American journals; Psychology; journals committees; Journal Citation Reports. The aim of this paper is to present and analyze the research from the Spanish University System for the period 2003-2012. This is a descriptive study using publications in Web of Science and other input and output of R&D from official sources. The data were obtained from the third edition of IUNE (Investigación en la Universidad Española) Observatory (2014). The results show that the number of teachers was 60000 per year with an increase of 14% in the decade studied. The number of documents published in WoS was 332351, increasing by 112% in these 10 years. The most productive area was Experimental Sciences (40%). One of the most important characteristics is the growth of international collaboration (35% to 42%). Impact indicators show an average of 11 citations per document, 48% of papers published in journals in the first quartile (Q1) and 7% in TOP3. Data on patents, theses defended, predoctoral fellowships, and participation in national and European Union programs, complete the overview of the research activities into the Spanish universities system. These results show a sustained increase in productivity and a clear tendency to the internationalization of research activity of the universities. Keywords: IUNE Observatory; Spanish Higher Education System; universities; university rankings; research assessment.